Sending my best wishes, from my sweet, small town, for a Happy 4th of July. "We must be free not because we claim freedom, but because we practice it." A fitting photo Linda, thank you and wishing you all a very Happy 4th of July. Wishing you a very happy and safe 4th of July! This photo says it all!!! It's EVERYTHING America is about. May you share happiness and find a day of freedom with your family today. Small town America at its best! Happy 4th! i love your sweet, small town!! happy 4th!!! 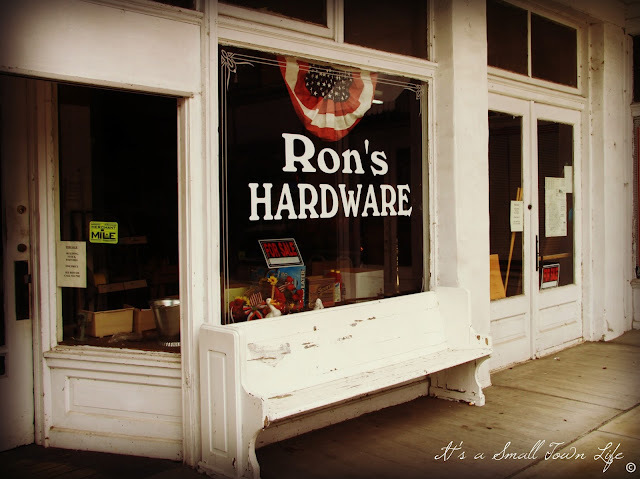 Too bad about Ron's! Happy 4th to you! ...small town America at its best. Belated holiday wishes to you and your family, Michelle. There's nothing like a holiday celebration in as small town as we well know from our 12 years of small town living. The July 4th holiday was celebrated with an ice cream social and band concert in the next town over from ours and if we still lived there, we would be there. Looks like a great little hardware store too. Hope you had a nice Independence Day as well. Love your little town...Happy fourth to you and yours. Let's keep practicing that Freedom . . .